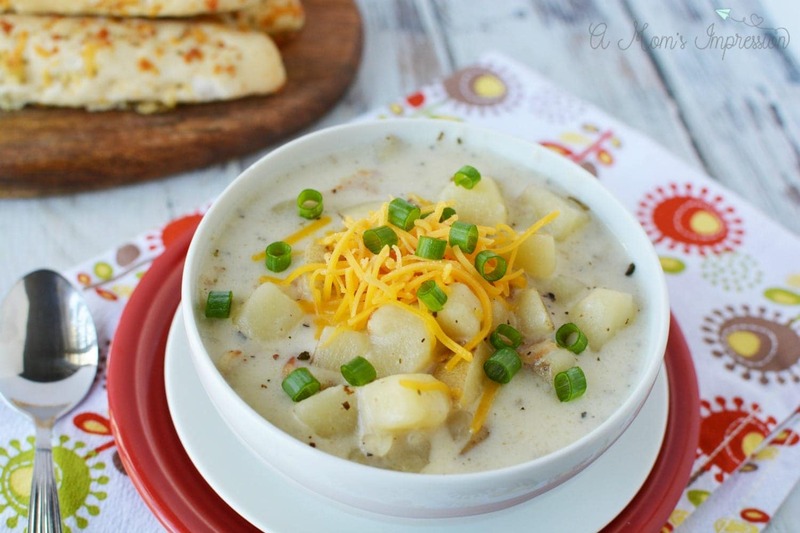 Instant Pot Potato Soup is the perfect, simple loaded potato soup recipe that is ready in 20 minutes! This recipe is loaded with potatoes, cheese, and bacon and is the ultimate in comfort food soups! The weather finally took a turn for the cooler temps this week. Fall is officially here. When I think of fall I think of sweaters, boots and homemade soup! 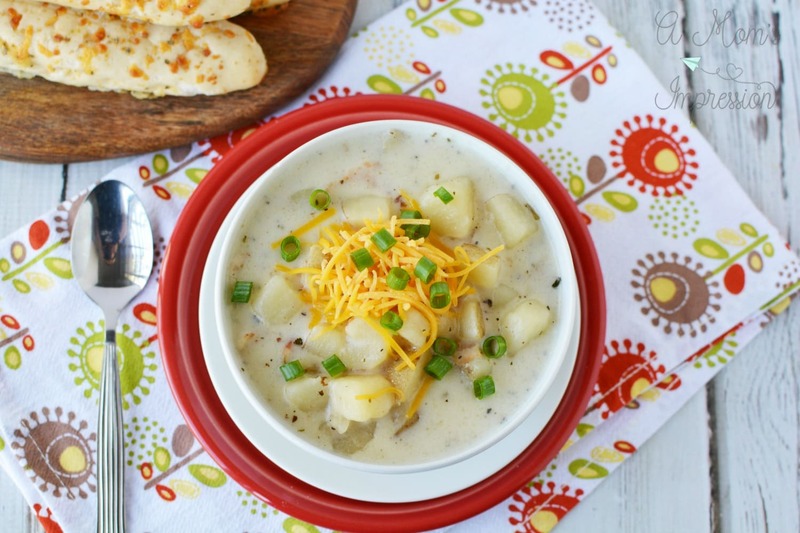 This Instant Pot Potato Soup recipe is one of my family’s favorites for a few reasons. First, it is economical and we usually have everything we need right in the pantry. In fact, this is one of my family’s favorite $5 dinners. 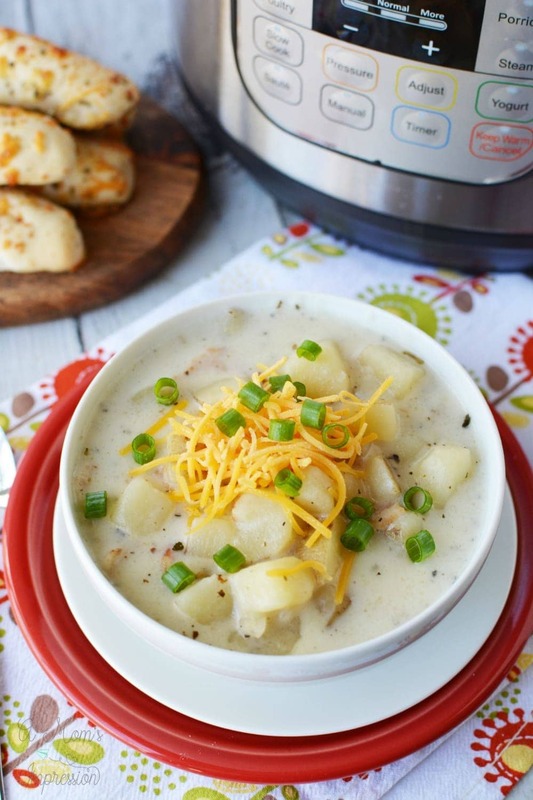 Secondly, this pressure cooker potato soup can be made in about 20 minutes start to finish. We have all had those nights where we have slacked on meal prep or need to get a meal on the table quickly and this recipe is perfect for those nights. By using your pressure cooker, you get the same flavor and taste that slow cooking on the stove will give you in a fraction of the time. If you are new to using a pressure cooker be sure to check out our Pressure Cooker Guide for tips, tricks, and some easy Instant Pot recipes. Another reason we love this is that it is easily adaptable. Think about your favorite loaded potato soup, does it have ham and cheese in it? Is it filled with bacon and topped with sour cream? Do you like corn in your potato soup? You can easily make this recipe into the loaded baked potato soup recipe of your dreams! 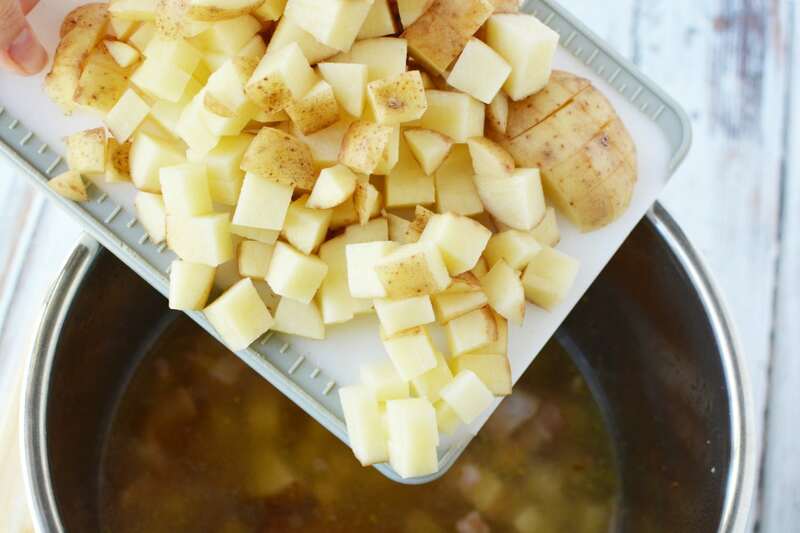 What kind of potatoes are best for the Instant Pot? I used white potatoes in this recipe and it turned out very well. They don’t get too mushy and give the loaded potato soup just the right texture. If you don’t have white potatoes you can use russet or most any potato you have on hand. I did not peel my potatoes (I like the extra benefit of the potassium) but you certainly could if that bothers you. One pot meals are my favorite kind of meals and this dump and go Instant pot recipe is so simple and easy. Cleanup is a breeze because you are only using the Instant Pot pot and not having to use any additional skillets. For more delicious Instant Pot soup recipes be sure to check out our Chicken Gnocchi Soup and our Blue Ribbon Chili recipe! 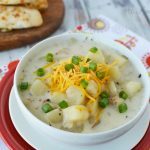 Instant Pot Potato Soup is the perfect, simple loaded potato soup recipe that is ready in 20 minutes! This recipe is loaded with potatoes, cheese and bacon. Add bacon and onion to instant pot and saute until bacon is cooked. Add potatoes, broth, salt, and basil and mix well. Place the lid on the instant pot and seal shut. Close the pressure release valve. Set the instant pot to manual, high pressure for 5 minutes. When the cooking cycle is complete, quick release pressure. Open the pot and carefully stir in half and half. Set the pot to saute and add the cornstarch. Heat until bubbly and liquid begins to thicken. Remove from heat and serve topped with shredded cheese and chopped green onions. Oh my goodness.. I made this tonight and I had 1 bowl and my husband finished the pot lol. It was so very good. I did not have half & half so I used 2 tsp and 1 cup of milk and of course is all I had was 2%. But, it turned out very good and I will be fixing it many more times… Thank you for sharing your recipe! I am so happy you and your family loved this recipe! Thank you for letting me know.